Almost 70% of online shopping carts are abandoned. Save some of that revenue and uncover purchasing issues with abandonment recovery emails. Provide customers with valuable product information like warranty or return policies, and take advantage of high open rates to include upsells or related products. Send a personal hello to new customers and thank them for their business. Start to build a community, and cross-sell them on related products. Engage inactive customers by sharing new product information or offering a discount to bring them back to your store. Sell something people regularly purchase? Send replenishment reminders to increase lifetime value in a way that’s helpful to customers. We analyzed data from millions of abandoned cart recovery emails and found that the average recovery rate is over 15%! The average store recovers over 15% of their abandoned carts using our basic 3 email series. But you can go further and use our advanced features, like email subject line personalization, dynamic content, and unique discount codes, to recover even more carts and boost your revenue. Ready to send lifecycle emails? 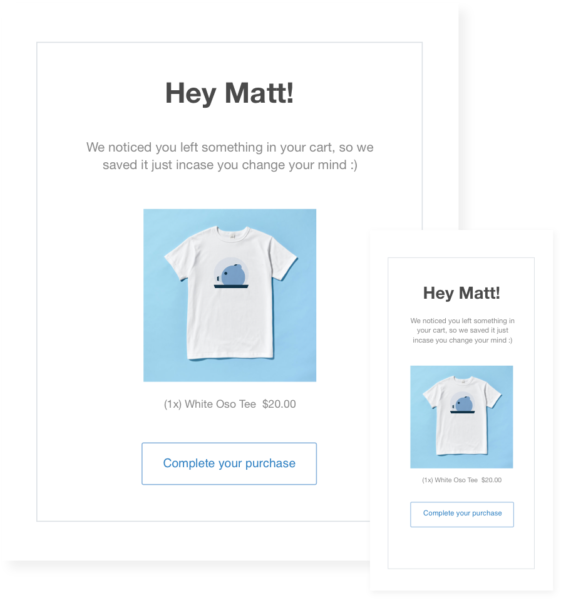 Delight your customers & boost sales with lifecycle emails. Start your 14-day free trial and set up your first lifecycle email campaign in 15 minutes or less.